If you are a police officer, you probably know how important it is to carry a flashlight with you at all times. For the duties and activities of a police officer, a simple household flashlight is not the right choice. The flashlight you have should be water resistant, much more powerful, have a long lasting battery, and highly durable. While it is one thing to know the importance of having the right police flashlight, finding the best one that suits your needs is totally different. 0.1 Why do you specifically need a police flashlight? Why do you specifically need a police flashlight? As already mentioned, a household flashlight is not the right choice for police officers. Police flashlights, also widely referred to as tactical flashlights, are designed to be perfect for both everyday use as well as for hazardous circumstances. In addition to working great for tasks like reading and writing tickets and checking driver’s licenses, a police flashlight should also be durable enough to be used as a device for self-defense. The light should be bright enough to temporarily blind the enemy’s vision, and should have strobe function, which will enable you to disorient the attacks from your enemy. The light output of police flashlights will be measured in lumens. This basically refers to the level of intensity of the light that comes out of a flashlight. In most cases, a flashlight will deliver highest brightness when powered by new batteries. Police flashlights today come with multiple light settings, so you can change the level of brightness based on the application. You will be able to find flashlights with outputs ranging anywhere between 20 lumens and 3500 lumens. Water resistance is an important feature to look for in a police flashlight if you are working in a region where it rains constantly. You can also look for specific ratings like water submersion rating and splash resistance rating. Most police flashlights today are made with LED bulbs. Yes, you will be able to find incandescent bulbs in a few models; however, those bulbs cannot even match the brightness, impact resistance, run time, and energy efficiency features of LED bulbs. Therefore, choosing a police flashlight with an LED bulb would be the right decision to make. The size of the flashlight is another important aspect you should consider. When it comes to police flashlights, you have a wide range of options in terms of size. You can choose something as small as a keychain flashlight, or a weapon light. However, you need to make sure that the flashlight you choose will sit inside your palm comfortably and not too bulky, and should easily fit in your pant or jacket pocket. Modern police flashlights come with different illumination modes using which you can adjust the brightness level of your flashlight to suit the application. Most flashlight models offer three modes: low, medium, and high. You will also be able to find flashlights with strobe function, which is again useful for different scenarios. The battery used in the device is yet another critical factor in the selection of the best police flashlight. This is because batteries play a crucial role in the weight, run time, light output, and other such characteristics of a flashlight. When it comes to choosing batteries, you need to decide between disposable and rechargeable batteries. The most common types of disposable batteries are AA and AAA. These batteries are easily available and affordable as well. CR123A is another popular choice; but, these batteries can be hard to find and are more expensive. Rechargeable batteries are known to help you save money in the long run, as they can be recharged and reused for a long time to come. Using a USB connection, a solar panel, or an AC or DC outlet, recharging the batteries of your police flashlight will be easy. Since police flashlights are mainly meant for tactical use, they must be made of highly durable materials. Hard anodized aluminum and polymer are two of the most commonly used durable materials for police flashlights. Both these materials have their pros and cons. Based on your use and needs, you may choose a flashlight made from one of these heavy duty materials. Are you an outdoorsy person? Then you should definitely read through to know more about this exciting product perfect for camping, hiking and all your outdoor activities. This high powered tactical flashlight is a perfect companion for walking through the woods at night or even during transitional light conditions. Outdoor activities and retreats should be performed with precision and Outline A100 lets you do exactly that. 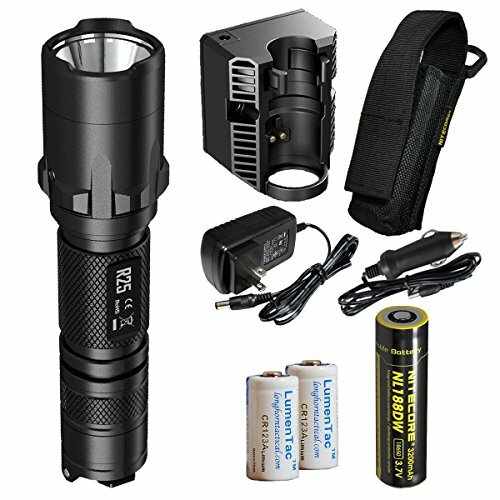 There are many portable outdoor flashlights but this product incorporates cutting edge technology, precision and is by far one of the best in the market that can be used in the outdoors as well as for your activities as a police officer. Light output of a flashlight is one of the crucial factors, especially in the tactical flashlight segment. Outdoor tools such as this are ultimate survival tools and it is necessary to make sure that you get the best tools available. 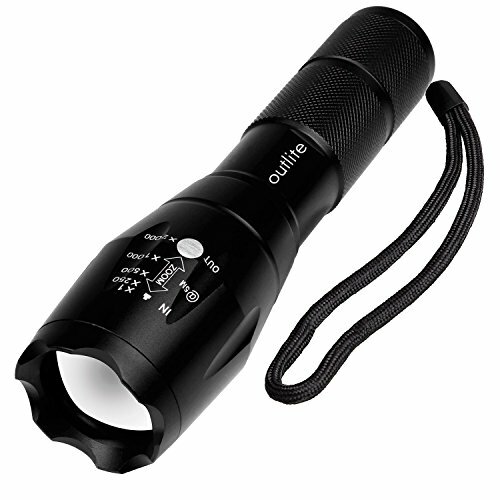 Lumen capacity of Outlite A100 is the best in outdoor tactical flashlight segment. A superior build quality makes it one of the best outdoor accessories for police officers, hikers, and also mountain bikers. The fact that Outlite A100 is portable makes it one of the best picks. Aluminum alloy construction incorporated in the flashlight makes it scratch resistant and long lasting. This feature is perfect for outdoors where scratches and coming in contact with rough surfaces are quite common. Great handling makes it a fall proof product as well. CREE XM-L T6 LED used in Outlite A100 gives superior light output and to be fair to the product, this is one of the brightest flashlights. 900 lumens of high intensity light will be emitted for more than 100K operating hours, which is great. With 3 light output modes like SOS, Strobe, and High, you can get the output you are looking to use. Focus feature lets you zoom-in and zoom-out, which is a great addition to the product. Single button operation makes it user-friendly, although some used to toggling multiple buttons on flashlights may find it less equipped. Apart from that, this button is easy to operate and lets you navigate through all the different modes easily. Outlite A100 comes with an 18650 rechargeable battery with the package and this battery is considered below par compared to other products. Battery charging time is around 7 hours. One good thing about this battery is that, if it wears out, you can simply buy a new one rather than buying a new charger. Every product has its ups and downs; same is the case with Outlite A100. Lack of a manual may worry some, but it is quite manageable. Memory mode function can make this product even more competitive and user intuitive. Battery quality is comparatively lower than industry standards. Apart from these there is nothing much negative to say about this product. Police officers will certainly find this product very useful. Strong build and light quality gives it the edge. Lack of memory mode functionality. The battery is a low quality one compared to the industry standards. 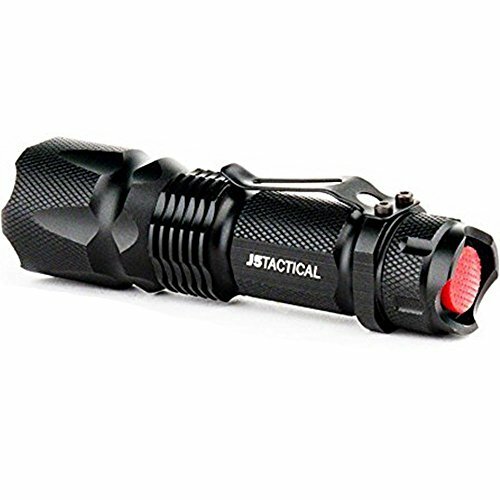 J5 Tactical V1-Pro flashlight packs a punch considering its size and dimensions. The sturdy body and compact dimensions make it the best choice for those working in law enforcement, and even for amateur hikers and campers. J5 Tactical V1-Pro has all the features that you can find in a top class gadget. Flyweight design philosophy makes it easily accessible and handled even by people with small hands. The super bright light output from this small flashlight is what makes it a popular option. This tactical flashlight can be used for multiple purposes and the design lets you use it anywhere you want. Glossy black aluminum alloy construction makes it scratch resistant. With 300 lumens light output, you will be amazed by the light output that you would achieve from it. It comes with different lighting modes such as Strobe, High and Low. There is an option for adjusting the beam focus as well. The product does not come with a battery, which is disappointing. A 14500 3.7V battery should be purchased. Hunters, campers and even law enforcement officials are finding this product extremely useful for their duty. Many users seem to customize this flashlight in order to suit their requirements at the most. Affordable price tag is one of the key success factors of this flashlight. Let us focus more on the product features and drawbacks if any. Brightness level is very high, and there is a warning of blinding effect; therefore, we would suggest you to handle the device properly. Focus range adjustment makes it one of the best survival flashlights around. It does not have multiple lighting modes like other premium flashlights but it does the job pretty well. Most of you may misconceive build quality considering the price at which J5 V1-Pro is offered, but you will find the difference once you lay your hands on it. You will not find a battery or a kit when you purchase this flashlight. Ridged bezel is provided as a safety feature for the user when confronted by an attacker. Tail switch button is not perfect and many users complain of issues pertaining to it over time. If you are an extensive flashlight user, then you may find this switch issue really frustrating. For emergency users, it won’t pose much problems and the easy to use nature is certainly helpful. Water proof properties are not that good either and this flashlight is not fit for underwater usage or adventure. Battery, kit and other accessories need to be purchased separately, which is also a drawback. J5 V1-Pro may be small, but it offers plenty of features at an affordable price, making it a good choice for beginners. Water proof feature is kind of limited. Switch button has its issues. Battery needs to be purchased separately. 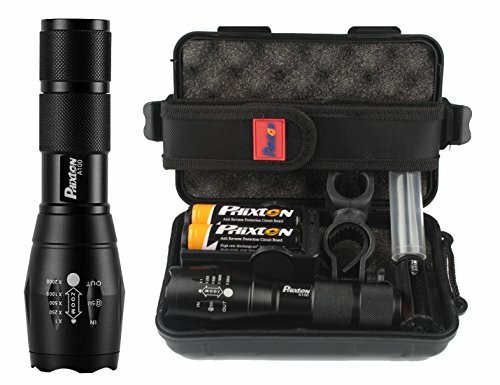 Phixton is a well known tactical flashlight manufacturer that has launched many different flashlight models to cater the needs of people with different interests. If you are looking for a military grade multi-purpose tactical flashlight, then Phixton 1200 lumen is the product tailor made for you. This flashlight comes loaded with all the premium features that you would expect from a flashlight aimed at police officers or a pro outdoor person. This is one of those flashlights build to last long and satisfy the needs of all kinds of users. You can use it indoors, outdoors, while camping, hiking, emergency situations, military purposes, law enforcement, and a whole lot more. The 1200 lumen light output capacity based CREE XM L2 LED emits the brightest light beam. The output is 20% more than the standard T6. 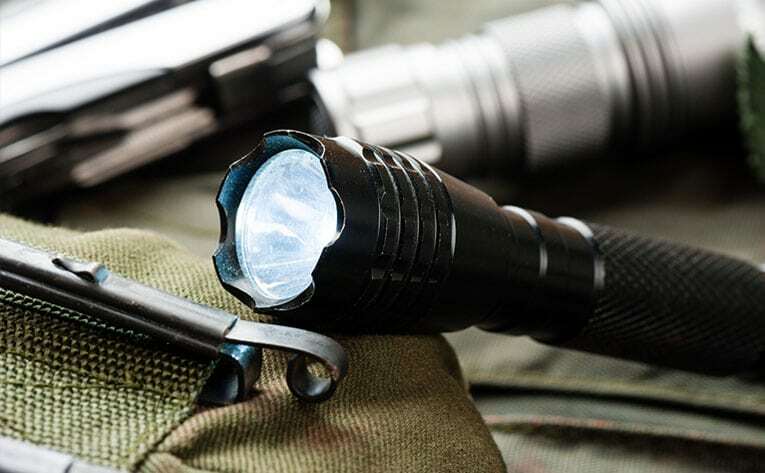 The fact that this flashlight comes fully loaded with a host of features and accessories makes it one of the best military grade flashlights. Accessories such as dual slot charger, gift box, bike mount, pouch etc. are offered with the product. You get 2 rechargeable 18650 batteries with the pack. Proper power management will let you make these two batteries last longer. Strong aluminum alloy construction gives it the rigidity to tackle all kinds of physical and climatic conditions. This is definitely one of the best flashlights for performing your duties, as well as for hiking, camping, mountain biking, touring and all kinds of outdoor activities. Strong head is designed to protect the user in case of emergency situations. Gift box, pouch and protective case make it one of the best gifting flashlights available at the moment. Dual slot charger is adjustable and this will let you charge any other device that you may carry with you. Just like most of the flashlights, Phixton tactical flashlights are shockproof. Long press of the switch will ON/OFF the flashlight. Beam focus can be adjusted by pulling the flashlight head. There are 5 different lighting modes, which include low, medium, high, SOS and strobe. By pressing the switch lightly, you could change the modes. Bike mount that is provided with the flashlight gives you 360˚ lighting ability and by proper installation you could use it even as your bike headlight. Some users have complained about the quality of the accessories. The company, by offering multiple add-on products as one package, might have missed to hit the sweet spot on all the accessories. The device may not be too tactical in terms of its performance and features for some. But, to be fair to the product, Phixton has managed to provide a user friendly, feature rich, well accessorized tactical flashlight serving all purposes. Multiple light modes, adjustable focus and zooming options. 2 Rechargeable 18650 batteries come with the product. May not be too tactical for some. Quality of accessories can be improved. Vizeri LED tactical flashlight is very popular mainly because of the tiny attention to detail that is given to the product. Flashlights are a must not only for outdoor activities but are valuable for tackling all kinds of pitch black environments, especially those that police officers encounter on a regular basis. Vizeri has given this tactical flashlight a military grade construction and design. 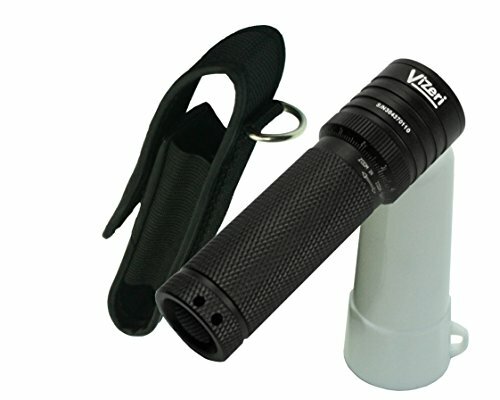 Vizeri LED flashlight comes with focusing lens and this provides light even during emergency situations. Let us discuss more about this flashlight. One crucial feature that differentiates Vizeri flashlight from other leading brands is the multiple lighting modes that come with the memory option. There are 5 different lighting modes suitable for different purposes. Memory mode lets you activate your last used mode right away. Low, medium, high, strobe and SOS are the five different lighting modes. Original high quality CREE XML T6 or XRE Q5 LED bulbs make it one of the brightest and advanced flashlights. Vizeri uses threaded inline tube connection and this eliminates vibrations. This is also available only in this model of flashlight. Vizeri LED flashlights are waterproof up to 3 feet. Most of the tactical flashlights that you find in the market are simply water resistant. You can use it even under heavy rain conditions and you need not worry even if you accidentally drop it in a puddle of water. Tight seal and rubber O-rings are responsible for the waterproof property of this flashlight. Just like most of the tactical flashlights, even this is manufactured using military grade aluminum. A smooth finish design gives it the durability. Power source of this flashlight can be obtained using AAA batteries, CR123 alkaline battery or the highly recommended lithium-ion 18650 rechargeable battery. You have to purchase the battery separately, which is a letdown. Lifetime manufacturer warranty is offered to the customer and this is very commendable. To avoid the most conventional problem of spring erosion, gold plated springs are used instead of steel ones. This also supports in the long duration of the flashlight. Light diffuser and holster mounting are the standard accessories that you get with the product. Apart from that, you also have the option of buying other additional accessories such as bike mount, diffusers, weapons mount, etc. A kit consisting of all these accessories would have done wonders to the buyer. Vizeri LED flashlights come in two lumen ratings such as 230 and 460. If you are looking for the brightest then you can opt for the VZ 460 flashlight. Built-in zoom feature will also be useful for a law enforcement officer. Optical reflector technology incorporated in Vizeri tactical flashlights work exceptionally well in radiating higher output using a low input power. Verizon LED tactical flashlight is the perfect option if you are looking for a small, durable and reliable flashlight. An 18650 lithium-ion battery should be purchased separately. Charger unit for the rechargeable battery should also be purchased separately. Lack of kit and multiple accessories. SureFire is a well known flashlight manufacturer and they offer a wide range of tactical flashlights to customers with different backgrounds. Plenty of tactical equipments come under their roof and the user will have multiple options to choose from. Here we are going to review about the most exciting LED flashlight from them, the G2X series. G2X series comes in many different versions such as Pro, tactical, Combat light and law enforcement. All the G2X series flashlights carry the same DNA and this flashlight range is arguably the flagship category of the company. We shall tell you more about all of them in detail. G2X series flashlights are durable and highly reliable. Lighting capacity should be the strong point for a tactical flashlight and with 320 lumens light output, you get great output. High light output makes it suitable for performing all kinds of activities. Adaptive output management is available and this will let you reduce the power usage considerably without compromising on performance. Nitrolon body construction is arguably the most rigid construction you may need. Anodized aluminum based bezel is also part of the flashlight. Light window is made of polycarbonate and this makes it highly durable product on the whole. Tail cap switch, which is one of the important features of tactical flashlights, present in this product lets you choose between consistent light, intermittent and so on. One of the key advantages of G2X series flashlight is its compact dimensions. Customers appreciate the fact that they could carry the product in their pockets. Low and high light outputs give you the versatility you may need. Lowest light setting lasts up to 45 hours and this makes it one of the most efficient flashlights. Some customers have complained that the latest version of G2X flashlights have not been that bright compared to the previous models. Light output offered by the latest G2X version is well above the industry standards. G2X has high battery consumption, which is one of its weaknesses. You will find the running time very less even at full charge, which will not be suitable for outdoor enthusiasts. Customers have even reported problems in their lens covers, which will hinder the light penetration. All these minor flaws apart, G2X series products are one of the best tactical flashlights. Tactical users will find this flashlight very useful. Light performance and the materials used in this flashlight are top class. If you are looking for the best value for money, versatile, durable and compact flashlight then this is the best one you can buy right now. SureFire products are highly rated and the G2X series flashlight proves exactly that. It is very hard to find an economical product that packs a better punch. Easy to operate and feature-rich, the G2X is ideal for beginners. Accessories and tactical equipment can be mounted. Some lens covers are not up to par. Supernova Guardian is another exciting tactical flashlight from the company. Ultra bright tactical flashlight is an essential product for police officers, adventure enthusiasts, night lovers and all those who need to tackle dim and transitional light conditions. There are many tactical flashlights in the market and this product uses the latest LED lighting technology. Brightstar memory technology is incorporated in this flashlight, which makes it one of the best tactical flashlights that comes with 5 different lighting modes, which include SOS, Strobe, low, medium and high. Guardian 1300 comes loaded with features, so let us analyze about this product in detail. 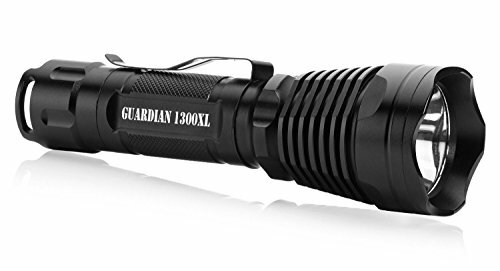 Guardian 1300 tactical flashlight has an exclusive emergency feature that comes in the form of Strobe mode. Deluxe Guardian 1300 flashlight set comes with both 3 alkaline batteries and 2 rechargeable batteries. You can power this flashlight either using the lithium rechargeable batteries or 3 AAA alkaline batteries. Supernova Guardian 1300 uses a booster circuit and this assists in enhancing the lifespan of the battery. This enhances the quality of your batteries and also eliminates the need for buying a new one. Aluminum alloy construction of the flashlight makes it scratch resistant, durable and shock proof. Accidental falling of the flashlight is prevented to a certain extent by the anti-slip handle. Brightest LED power output is guaranteed by the CREE XM-L U2 LED bulb placed in a clear tempered glass lens. There is an option for buying this flashlight either separately or as a gift pack. Deluxe gift set should be your preferred choice if you are getting this for your loved one. Apart from the flashlight, 2 rechargeable batteries, and 3 alkaline batteries, you also get belt clip and a magnetic gift box. This box is so precise and high quality that you will just love to place your product in it all the time. By purchasing this product, you get a 5 year manufacturer warranty and excellent customer support. Lighting output focus area is very large, which also makes it one of the best tactical flashlights. Safety, accessibility, durability and lighting focus area are the strong aspects of Supernova Guardian 1300. Soft tactical tail switch is one of the few drawbacks of this flashlight because it may wear off sooner. Some customers even complain about the lens quality. We have analyzed in detail about all the different features of Guardian 1300, and we would highly recommend you to buy the deluxe Supernova Guardian 1300 gift set. 2 Lithium ion and 3 AAA alkaline batteries come as part of the deluxe gift set. Booster circuit increases the lifespan of the battery. Super lightweight flashlight design and construction makes it durable, easy to operate and flexible. Tactical tail switch is soft, which makes it less durable. Not suitable for extreme outdoor users. A clear lens LED bulb cover would have done wonders. NiteCore is one of the leading Chinese flashlight manufacturers who are in the industry for more than a decade now. Multi-mode output based flashlights are the main area of expertise of the company and they have launched some of the best tactical flashlights till date. With more than 10 years of flashlight experience, they are one of the leading manufacturers in the market. The company is offering many different types of flashlights to law enforcement officials, and now we shall discuss in detail about NiteCore R25 800 Lumens tactical flashlight. NiteCore R25 tactical flashlight, as you may know, comes with an 800 lumens light power output that covers a beam distance of almost 320 meters. R25 is a versatile flashlight which comes with a smart charging dock, which is unlike any other product in the market. CREE XP-L HI V3 LED bulb gives out maximum power output, thus providing excellent brightness. Strobe ready mode is an exclusive emergency mode and is offered in many tactical flashlights. Smart charging dock is the most exciting and special feature. This is a mechanical lock which is designed precisely for easy operation. You can fix the charging dock on the wall or on any solid surface you prefer. The device will be in full charge at all times. R25 flashlight comes with a NL188DW 3200mAh Lithium ion rechargeable battery. The charging dock is designed to recharge only this type of battery. You can even use 1 X 18650 battery or 2 CR123A batteries for powering the flashlight. Adapters and car chargers are also part of the product and the charging dock works seamlessly well with every single one of these products. Compact dimensions make it one of the most easy to use flashlights. Strobe ready metal switch is provided exclusively for swift tactical operations. Just press and hold the strobe ready metal button to activate strobe mode. The same button can be pressed to change the brightness level when the light is ON. Customers can buy NiteCore R25 800 lumens tactical flashlight with a whole list of accessories bundled up together as a package, like the smart charging dock, power adapter, titanium plated stainless steel grip, tactical ring, and a rechargeable battery as we mentioned earlier. It comes with 3 personalized settings for different purposes. The three different modes are general, law enforcement, and tactical. Switch off the light, loosen the flashlight head and then tighten it along with pressing the strobe ready mode. You can identify the mode you are in with the help of the indicating flash. Single flash indicates tactical mode, double flash for law enforcement, and triple for general. Strobe and high are the two modes under tactical operation. Law enforcement mode includes strobe, high and mid. General includes all the different lighting modes. Anti-rolling head and specially designed head are also great. It is very important to buy R25 flashlight from an authorized dealer because it comes only with a 1 year manufacturer warranty. This is one of the drawbacks of this product because there is no guarantee that the smart charging dock will last longer. R25 is priced comparatively higher than other premium flashlights. Only 1 year manufacturer warranty. Pricing is a bit higher compared to other products. Fenix-Store entered the flashlight market relatively recently, around eight years ago, and has gradually developed into a favorite brand for high end flashlights that are also affordable. Despite their reasonable pricing, Fenix flashlights are known for their high quality, equipped with advanced flashlight technology. In the flashlights category, the company now produces a wide range of models belonging to different series, such as E series, LD series, FD series, RC series, SD series, TK series, and a lot more. The PD series flashlights from Fenix are known for their professional performance, and this particular model happens to be a favorite among users. The Fenix P series flashlights, to which the PD35 TAC model belongs, are designed to provide great light output with remarkable run times, making them perfect both as a backup light or a primary light. The lights are also given the ability to operate at the desired lumen level until the power supply can support the same, and will then go down to the next lower level. The PD35 police flashlight model from Fenix is designed and delivered as a pocket size flashlight option, and hence happens to be one of the smallest flashlights in the category. However, don’t let the size mislead you; despite its compact size, this tactical flashlight can stand the test of times like you would never imagine. The flashlight is made from premium quality materials that make it shock proof and corrosion resistant. The design of the body is slip resistant, and the lens or optics is made with clear-glass anti-reflective coating. The PD35 is one of the few police flashlights that are packed with a lot of different modes you can use. For tactical use, you can choose between Turbo mode (1000 lumens), Low mode (60 lumens), and Strobe (1000 lumens). For outdoor use, you have options such as Eco mode (8 lumens), Low mode (60 lumens), Mid mode (200 lumens), High mode (500 lumens), and Turbo mode (1000 lumens), along with Strobe. The high performance beam power makes this police flashlight ideal for both tactical and outdoor use. When the light is turned on, it will automatically enter the output mode that you last used, using what the company calls Intelligent Memory Circuit. Under the Tactical Mode, you can use the tail switch to change between modes, and this switch is made from high quality rubber to make operation smooth, easy and convenient. Not to forget, the PD35 is waterproof and can last underwater for thirty minutes up to 6 ½ feet. Anti-polarity protection – protects the device when batteries are installed wrong. Bundle includes only regular batteries and not rechargeable ones. Established in 1973, Streamlight is a company that is known to design and manufacture products after gaining a complete understanding of what their customers need by doing what they do. The company’s employees undergo low-light shooting courses, firefighters’ training, and gain more such experiences in the real world to come up with products that are not only appealing, but also completely efficient. As a result, Streamlight remains a go to brand in the industry and their flashlights are wide preferred and used by various law enforcement agencies around the world. If you have been searching for a police flashlight that will make your colleagues refrain from using their flashlights and go for yours, one that is sure to impress you and very rarely fail you, the 75458 Stinger DS LED Rechargeable Flashlight would be a viable choice for you. Built with C4 LED technology and thousands of hours in lifetime, this police flashlight is something that will easily piece through darkness. When it comes to quality, the Streamlight 75458 Stinger is one of the top end flashlights you will be able to find on the market today. Made with machined aircraft aluminum, unbreakable lens with scratch resistant coating, and equipped with non-slip rubberized grip, this police flashlight basically offers all the features you would look for in one such device. In addition to being shock proof, this flashlight is also impact resistance up to one meter and water resistant as well. It accepts both NiCd and NiMH batteries. The pack comes with a NiMH battery that is known to be rechargeable up to thousand times. Any best police flashlight should be powerful enough to deliver excellent brightness; thus, not only making it easier for you to see in the dark, but also to use it as a tool to blind your threats temporarily. With the ability to produce a maximum of 640 lumens of light, the Streamlight Stinger 75458 is definitely one of the brightest flashlights available in this category. Also, the flashlight comes with a white light instead of a yellow one, which is another aspect most users seem to welcome. Like with many other best police flashlights, the Streamlight Stinger offers multiple modes of operation. The flashlight can easily and quickly adapt to your specific illumination needs. Proving its versatility with its low illumination mode at 170 lumens, mid at 340 lumens, and high at 640 lumens, it is a tool that you can use for any intended purpose. Yes, there are some cons. Firstly, some users feel that the battery doesn’t last long as expected or claimed. Also, the charger that comes with the pack may not be that great. One obvious downfall is that the flashlight is quite pricey for a product in this category. Multiple operation modes and strobe. Charger may not be great. Battery may die sooner than expected. Originally established in 1969 as Newport Corporation, the company started its journey in the industry with their laser sight. It was then renamed as Laser Products and the company became an industry leader in producing handgun sights used by SWAT teams and other law enforcement agencies. SureFire was later born, and proceeded to establish itself as a leading manufacturer of compact, powerful and strong lighting tools for tactical use, from laser sights and baton lights to weapon-mounted and handheld lights. Today, the brand is well-known for its durable tactical illumination tools, including its police flashlights. 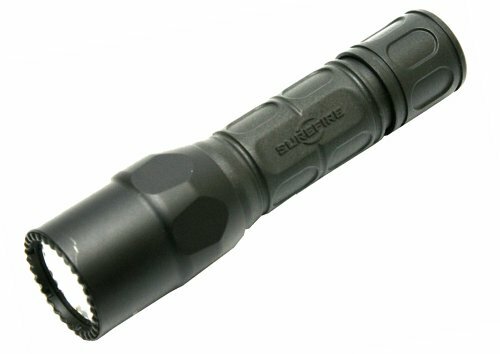 Fury series flashlights from SureFire are known for their ability to deliver a completely focused beam of light for tactical use. 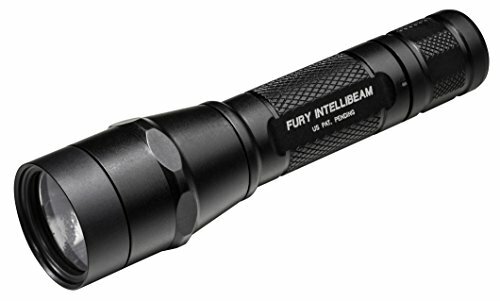 The SureFire P2X Fury is one of the most popular flashlight models from the brand. What makes the P2X Fury with IntelliBeam Technology a highly regarded model currently is the technology itself, which basically adjusts the light output automatically to match your surroundings. The flashlight can deliver light output even as low as 15 lumens up to 600 lumens, making it perfect for both indoor and outdoor use. The body of SureFire P2X Fury police flashlight is made of high-strength aerospace aluminum, which is ergonomically designed to provide you with a comfortable yet highly secure grip. And the fact that the body is also hard anodized to military specifications gives you the assurance that you are indeed buying a product that is extremely durable and can resist corrosion and abrasions. With the IntelliBeam technology, you will no longer have to spend time adjusting the illumination level of your flashlight to get the perfect light output, but rather focus only on the task at hand. The variable output LED works quickly and excellently; the brightness level will stay low when you turn the light on towards a near object, and it will automatically and quickly get to its full brightness level when you focus it on a distant target. A quick double click on the solid tail switch is all that is required to attain full brightness at any distance. With all these amazing features, the SureFire P2X Fury IntelliBeam police flashlight is still light in weight, making handling easy and convenient. Some drawbacks of this police flashlight model are that it doesn’t have a strobe function, a feature that most police officers expect. Also, the batteries are known to drain pretty quickly; therefore, you may have to stock up on batteries. Adjusts to surrounding conditions with the IntelliBeam technology. Easily adjustable full brightness level.